The core which is approximately 7000 kilometers in diameter (3500 kilometers in radius) and is located at the Earth's center. The mantle which surrounds the core and has a thickness of 2900 kilometers. The crust floats on top of the mantle. It is composed of basalt rich oceanic crust and granitic rich continental crust. Figure 10h-1: Layers beneath the Earth's surface. The core is a layer rich in iron and nickel that is composed of two layers: the inner and outer cores. 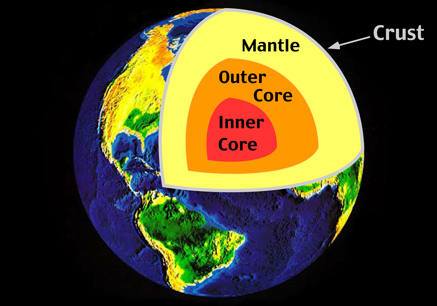 The inner core is theorized to be solid with a density of about 13 grams per cubic centimeter and a radius of about 1220 kilometers. The outer core is liquid and has a density of about 11 grams per cubic centimeter. It surrounds the inner core and has an average thickness of about 2250 kilometers. The mantle is almost 2900 kilometers thick and comprises about 83% of the Earth's volume. It is composed of several different layers. The upper mantle exists from the base of the crust downward to a depth of about 670 kilometers. This region of the Earth's interior is thought to be composed of peridotite, an ultramafic rock made up of the minerals olivine and pyroxene. The top layer of the upper mantle, 100 to 200 kilometers below surface, is called the asthenosphere. Scientific studies suggest that this layer has physical properties that are different from the rest of the upper mantle. The rocks in this upper portion of the mantle are more rigid and brittle because of cooler temperatures and lower pressures. Below the upper mantle is the lower mantle that extends from 670 to 2900 kilometers below the Earth's surface. This layer is hot and plastic. The higher pressure in this layer causes the formation of minerals that are different from those of the upper mantle. The lithosphere is a layer that includes the crust and the upper most portion of the mantle (Figure 10h-2). This layer is about 100 kilometers thick and has the ability to glide over the rest of the upper mantle. Because of increasing temperature and pressure, deeper portions of the lithosphere are capable of plastic flow over geologic time. The lithosphere is also the zone of earthquakes, mountain building, volcanoes, and continental drift. The topmost part of the lithosphere consists of crust. This material is cool, rigid, and brittle. Two types of crust can be identified: oceanic crust and continental crust (Figure 10h-2). Both of these types of crust are less dense than the rock found in the underlying upper mantle layer. Ocean crust is thin and measures between 5 to 10 kilometers thick. It is also composed of basalt and has a density of about 3.0 grams per cubic centimeter. The continental crust is 20 to 70 kilometers thick and composed mainly of lighter granite (Figure 10h-2). The density of continental crust is about 2.7 grams per cubic centimeter. It is thinnest in areas like the Rift Valleys of East Africa and in an area known as the Basin and Range Province in the western United States (centered in Nevada this area is about 1500 kilometers wide and runs about 4000 kilometers North/South). Continental crust is thickest beneath mountain ranges and extends into the mantle. Both of these crust types are composed of numerous tectonic plates that float on top of the mantle. Convection currents within the mantle cause these plates to move slowly across the asthenosphere. Figure 10h-2: Structure of the Earth's crust and top most layer of the upper mantle. The lithosphere consists of the oceanic crust, continental crust, and uppermost mantle. Beneath the lithosphere is the asthenosphere. This layer, which is also part of the upper mantle, extends to a depth of about 200 kilometers. Sedimentary deposits are commonly found at the boundaries between the continental and oceanic crust. One interesting property of the continental and oceanic crust is that these tectonic plates have the ability to rise and sink. This phenomenon, known as isostacy, occurs because the crust floats on top of the mantle like ice cubes in water. When the Earth's crust gains weight due to mountain building or glaciation, it deforms and sinks deeper into the mantle (Figure 10h-3). If the weight is removed, the crust becomes more buoyant and floats higher in the mantle. This process explains recent changes in the height of sea-level in coastal areas of eastern and northern Canada and Scandinavia. Some locations in these regions of the world have seen sea-level fall by as much as one meter over the last one hundred years. This fall is caused by isostatic rebound. Both of these areas where covered by massive glacial ice sheets about 10,000 years ago. The weight of the ice sheets pushed the crust deeper into the mantle. Now that the ice is gone, these areas are slowly increasing in height to some new equilibrium level. 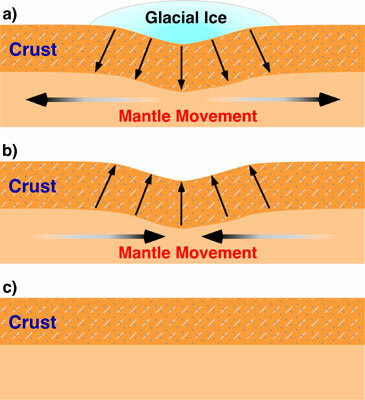 Figure 10h-3: The addition of glacial ice on the Earth's surface causes the crust to deform and sink (a).When the ice melts, isostatic rebound occurs and the crust rises to its former position before glaciation (b and c). A similar process occurs with mountain building and mountain erosion (see topic 10l).